What is Fuel Adjustment Factor (FAF)? The Fuel Adjustment Factor or FAF is a surcharge added to your transport rates to cover the cost of fuel. You will find that most established transport companies will provide the FAF surcharge as an additional cost to your agreed rates. This can many advantages to your business. Fuel is a dynamically priced commodity forcing the FAF surcharge to change constantly. A FAF calculation table is commonly used to determine the FAF surcharge. The applicable fuel adjustment is based on the average pump price which is calculated from an independent source. The pump price is based on data collated from fuel purchases made every 24 hours, ensuring the Fuel Adjustment Factor is up to date and correct. With many factors contributing to fuel prices today having an understand of the Fuel Adjustment Factor can help towards saving your business money. The Mobile Crane business is also affected by fuel fluctuations, however, mobile crane hire occurs on sites with the transport element being a minor part of the transaction. 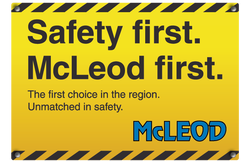 McLeod will therefore be applying the FAF to the hourly crane hire rate to reflect the fuel used in transport and crane hire use. McLeod calculates FAF by using the average pump price which we calculate from the web site www.pricewatch.co.nz.